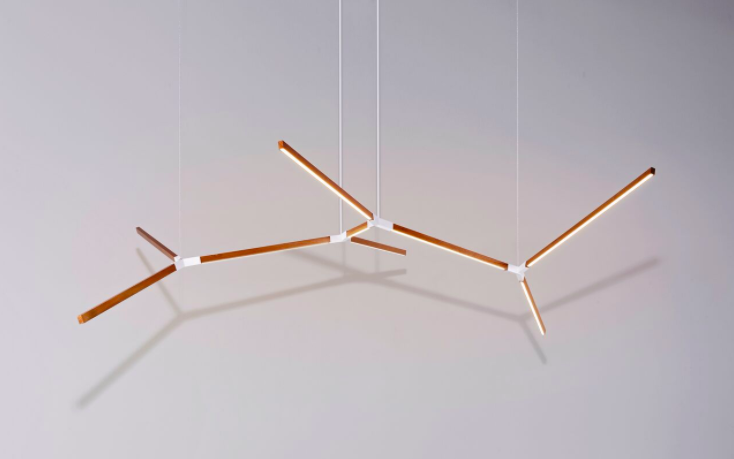 Unveiling at Collective Design, Stickbulb’s new suspended light sculpture draws its influence from an unexpected source—the ruins of the Chicago Pullman Couch Factory. “Fire and Ice” was designed in collaboration with RUX, the founding creative team behind Stickbulb, and is the follow-up to the partners’ NYCxDesign 2017 Best in Show installation, which repurposed 300-year-old redwood. Using wooden beams and fragments from the burned-down Pullman Couch Factory alongside a large-scale limited-edition art print of the building captured in its last moments, the installation is a reminder of the 2013 fire, which required a third of the Chicago Fire Department and, due to below-zero temperatures, created a veritable ice sculpture. “‘Fire and Ice’ will be a dynamic experience, portraying both fragmentation and fortitude, enticing visitors to experience the installation from all angles,” says Stickbulb co-founder Christopher Beardsley. The factory was comprised largely of longleaf, or heart pine wood, which has nearly become extinct due to its use in buildings in rapidly growing cities like Chicago and New York. “As heartwood takes a minimum of 200 to 400 years to mature, practically the only American heartwood to be found today is through salvage from structures such as the Pullman Couch Factory. With the creation of ‘Fire and Ice,’ Stickbulb celebrates the reuse of natural materials while preserving the beauty of this ancient wood,” note the partners.